My son, Kyle, is getting married in a few weeks. As a member of the Cowie family, he will be wearing a Fraser Ancient Hunting “Great Kilt”. “But aren’t all kilts great?” one might ask. Well, yes they are! The “Great Kilt”, however, refers to the historical “large wrap” (féileadh-mór) which was worn in the Highlands in the 16th-18th centuries. Also called a “belted plaid”, this type of kilt is worn wrapped around one’s body with the material loosely gathered and held at the waist with a belt. Some of the belted plaid hangs down to the knees and the rest of the material is wrapped up around the upper body over the left shoulder and held by a pin to keep it in place. The Gàidhlig word for “blanket” is plaide, and “belted plaid” is essentially saying it’s a woven, blanket-like garment that’s held on with a belt. (This is the garment that was forbidden to be worn from 1746-82 after the second Jacobite Uprising.) The modern version of the kilt, the short kilt (feilidh-beag, “little wrap”), came into fashion in the early 18th century. The (Anglicized) “philabeg” is just the lower part of the belted plaid, and was originally held in place with a belt until modern tailors stitched the gathers into uniform pleats. We in America call the pattern of stripes in different colors and widths which cross at right angles, “plaid”, but the pattern is really a “tartan”, tairtan (Scots), from the French tiretain, woven cloth. Tartans were sometimes woven without a pattern to them. The patterned cloth woven in the Highlands was called breacan, meaning “many colors”. As things evolved, the word “tartan” came to mean a certain pattern woven into a certain cloth. 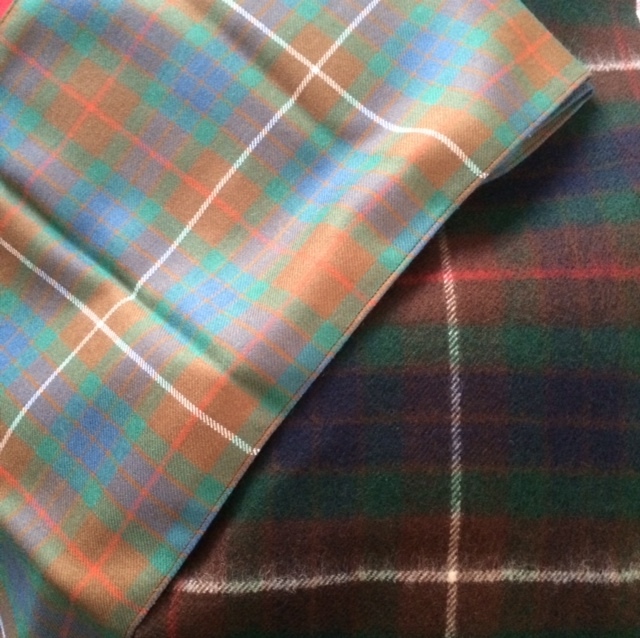 The terms “ancient” and “modern” when used to name a tartan refer to the difference in the color depth of the pattern. Modern is darker and ancient uses lighter colors that reflect the historical use of natural dyes. The pattern remains the same in both. A “weathered” tartan is meant to look as though it has been in use for a long time, or at least pulled out of great-great granddad’s attic. “Hunting” tartans and “dress” tartans refer to the changes in color of the patterns, not the patterns themselves. In the 17th and 18th centuries, the Highland women wore arasaide tartans that were woven with a white base. These were the “belted plaids” for the women: long flowing capes of tartan that could be wrapped around the body and up over the head (heid). In Victorian times, the “dress” tartan became associated with formal occasions because people didn’t want to wear the darker colors and thought the white-based tartan more festive. In the mid-1800’s a book published two tartans for the MacLeod Clan, one yellow and one green. After that, Clans that didn’t have green in their tartans started weaving another pattern to include green. They became known as “hunting” due to the green hues, not that they were worn especially for hunting. In 2008, the Scottish Parliament established the Scottish Register of Tartans “in order to protect, promote and preserve the tartan”. All tartans: ancient, modern, and brand new have to be approved and registered. A true tartan has a unique thread count, pattern, and colors, and has a specific name. Historically, that meant Clan names, but in modern times anyone can design and register a pattern for a tartan. The pattern is called a sett and was chosen on the availability of natural dyes in different areas, so each clan would have used the dyes available to them. This was the precursor to the modern-day Clan Tartan which came into existence in the early 19th century, probably with help from Sir Walter Scott. The sett is the measurement of the width of each stripe in the pattern; in modern times is it a precise thread count for each stripe. The series of stripes that make the pattern of the tartan reverse around a central stripe (pivot). The block pattern formed by the bands of stripe intersecting at right angles is repeated throughout the material. The warp threads are set on the loom and the weft threads are then woven in to them. Which brings us to “tweed”. Tweed was originally called tweel in Scots because it was woven in a twilled pattern. What that means is that instead of the weft threads going over one warp thread and then under the next, giving a smooth surface, it goes over two or three threads and under one or two, giving the fabric a pattern in the weave itself. It can be plain, or can have a herringbone or checked pattern by using two colors in the weft. If two or more colors of wool strands are twisted together before weaving, the cloth will have softly mixed colors called “heathering”. The story goes that a merchant in London mis-read the handwriting from the weavers Wm. Watson & Sons, Dangerfield Mills. He took the word “tweel” for “tweed” thinking it was a trade-name for the River Tweed that runs through the area where the cloth was made. Once the advertising was done calling it “tweed”, it became known that way. Harris Tweed is a very specific material that is woven in a specific way in a specific place. All Harris Tweed is woven on treadle looms in the homes of the weavers. Each specific pattern is done with hundreds of warp threads which have been tied by hand. The tweed is then sent to the mill where it is cleaned, dried, steamed, pressed and cut. I’m happy that Kyle has chosen the féileadh-mór (belted plaid) over the modern feilidh-beag (short wrap) and dress jacket. It suits him better (sorry for the pun). He’s very tall and with his long, thick and wavy hair and red beard, he’ll look the right fine Scotsman. 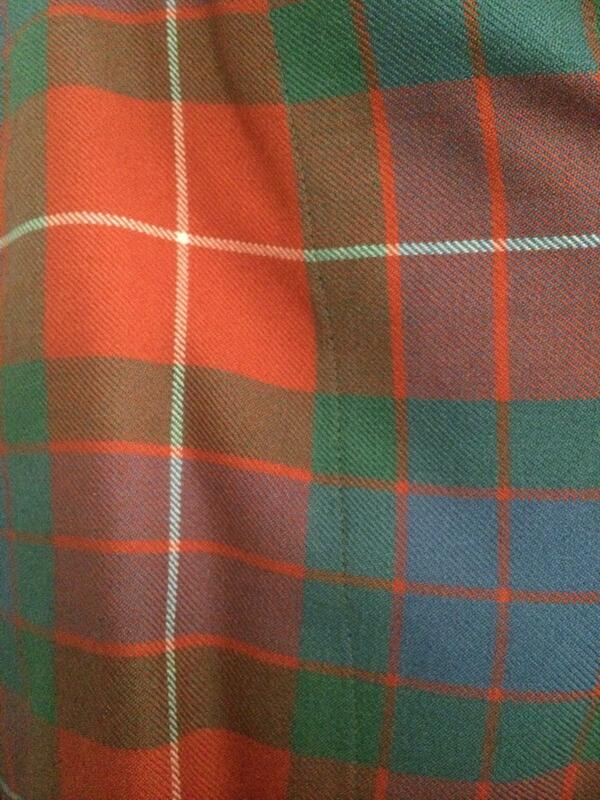 I’m also happy that he chose the Fraser Ancient Hunting tartan instead of the “dress” which is predominately red. And, I will be standing proudly, wearing the matching sash that I made at Lochcarron Mills in Wester Ross, Scotland. This entry was posted in Ancestry, Eco-travel, Scotland, Scottish ancestry, Scottish Dialect, Self drive Scotland tours, Travel, Uncategorized, Women Writers and tagged ancestry, Kilts, Scotland, Tartans, travel, Tweeds. Bookmark the permalink.